Tearmann Artist Studios, Castlekeeran, Carnaross, Kells, Co. Meath. The Group Art Exhibition will showcase the work of 10 local professional artists to include: Ann Meldon Hugh, Mark Smith, Jass Foley, Stephen Keaveny, Henry McGrane, Geraldine O’Reilly, Kate Flood, Jacqueline Keane, C. Olohan and Betty Newman Maguire. It will also give the 12 amateur artists who participate in Painting and Sculpture workshops at the Studio the opportunity to show their work alongside professional artists which will boost their confidence and give them a sense of pride in their achievements to date. Students Work will be on ongoing display on a Power Point Presentation in the Studios. This will give the 6 Art Portfolio Students who have just completed a preparation course at Tearmann and who presented their work to Art Colleges in 2018, the opportunity to showcase their work. This body of work that I have been working on is inspired by the fact that over the past 100 years the contribution that Irish women made in securing our independence has not been fully acknowledged. The 1916 proclamation begins by invoking "Irishmen and Irish Women". The Irishmen who led the Easter Rising have found their place amongst the pantheon of Irish heroes. Sadly, no such recognition has been given to the many women who played pivotal roles in Ireland's struggle for independence. Indeed the number who took part in the Easter Rising has been greatly disputed. It wasn't until recently on the 8th March 2016, on Women's International Day in Dublin where President Michael D. Higgins paid tribute to them that I became aware that in actual fact there were over 300 women who took part. Quote: President Michael D. Higgins on Women's International Day Royal Hospital Dublin. "It is my very great pleasure to have this opportunity to acknowledge publicly the great contribution of Irish women to the Easter Rising of 1916 and to the revolutionary movement at large. May I start by paying tribute to those historians who have so diligently documented the vital part that women played in the struggle for Irish freedom, thus ensuring that those who were long described as "forgotten women of 1916" are not forgotten any more. The full installation video can be seen HERE. I have always been passionate about our heritage and culture and felt driven to create this body of work mainly because of the lack of information in relation to how many women were involved. Having sourced the list of over 300 names from the Minister for Arts Heritage and the Gaeltacht, prior to them being made public, I wanted to celebrate their role collectively, in that whatever form the work would take, it would not put someone’s contribution before another's. I had applied to the ER Program at Emmanuel College Boston, MA., USA where there is a Social Justice Participant selected each year. I felt that my proposal would slot very well into the program and also that there is such a strong cultural connection between Ireland and America, particularly Boston, and also because of the facilities available to me there. Having worked tirelessly on the installation it was realized and the installation was exhibited at Emmanuel College, Boston and the Irish Cultural Center in Canton, New England, MA. and the Maine Irish Heritage Centre, Portland, Maine. The installation is called “Nir neart gur cur le cheile” and includes 300 handmade ceramic bowls, each of the bowls has a name inscribed onto its base. These bowls have been arranged in a circle on the floor and lit with candles. The second piece in the installation is a green wall hanging approx. 7 feet x 7 feet with 300 white ladies handkerchiefs loosely attached to green buttons, each embroidered with a ladies initials in orange and finally the third piece in the installation a video piece, where the names in white script of the 300 women are floating over a sea of tears to the music The Celtic Sunset. At each location I have invited a musician to play Mna na hEireann alongside the work. As part of the Residency Program at Emmanuel College, Boston, each of the 4 Resident Artists are invited to give a Lecture based on the work that they propose to realise while on the Residency. The focus of my work was “The Forgotten Heroines of the Easter Rising 1916” in Dublin, Ireland. Ní Neart Gur Cur Le Cheile - 1916 Women of the Rising - Betty Newman Maguire The list of over 300 names of the women who were out in the Rising, 1916. These names were compiled as part of the 2016 commemoration research undertaken by the department of Arts, Heritage and the Gaeltacht in Ireland. The 300 year old Farmhouse has been fully restored and re thatched in 2000. The original inglenook is still in place with many of the original features. Two bedrooms are available for residencies. 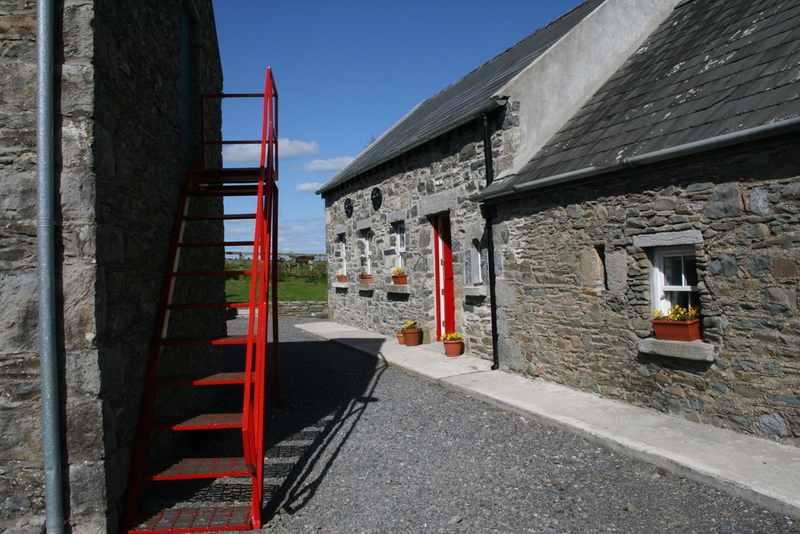 The studios are situated in Castlekeeran,Carnaross, Kells, Co. Meath. They are home to artist/sculptor Betty Newman Maguire and are housed in a 300 year old farmhouse with its own courtyard. These studios provide power points, access to water, work benches, tools and equipment, with a total height of 18 feet with an RSJ for block and tackle. Outside work space is also available.